Geraldine A. Ferraro died from blood cancer yesterday in a Boston hospital. She was 75 years old. While working by day as a schoolteacher, the New York native enrolled in night classes at Fordham Law School; "she was one of two women in a class of 179 and received her law degree in 1960." As a district attorney she focused on crimes involving violence against women; later, as a member of the U.S. House of Representatives, she pushed for legislation on equal rights, abortion rights, and other women's issues. 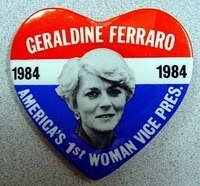 Ferraro made in history in 1987: chosen as the Democratic nominee for Vice President, she was the 1st woman to run at the top of a major party's slate. She and her running mate, U.S. Sen. Walter F. Mondale, lost the election to Ronald Reagan and his running mate, wo later would become the first of two men named George Bush to serve as President of the United States. For us, Gerry was above all a friend and companion. From the rough-and-tumble of political campaigns to the important work of international diplomacy, we were honored to have her by our side. She was a tireless voice for human rights and helped lead the American delegation to the landmark Fourth World Conference on Women in Beijing in 1995. Through it all, she was a loyal friend, trusted confidante, and valued colleague.